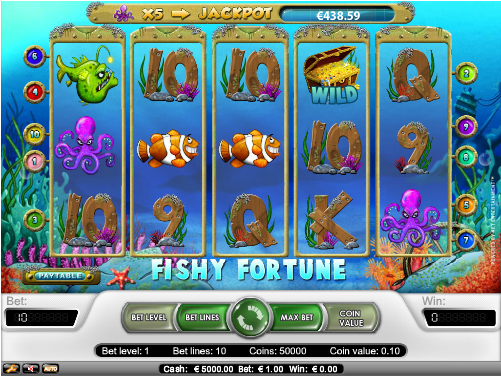 There’s no doubt that Net Entertainment produce some of the most attractive graphics and animations of any slots developer out there and Fishy Fortune is an online slot which is a great example of this. The premise of this game is actually quite simple – fish and other objects coexist in an underwater environment – but it’s all so well realised that the gameplay is almost secondary to the look and feel of the slot. 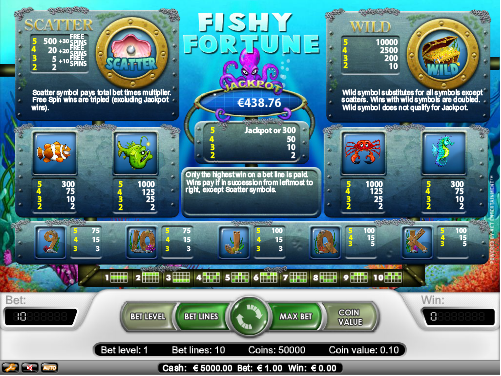 Fishy Fortune contains five reels and takes place over just ten paylines; all the action takes place underwater and there are plenty of colourful plants growing from the seabed. The low value symbols are the usual 9, 10, J, Q, K and A but fashioned out of driftwood, while a variety of colourful (and odd-looking) fish are the more valuable ones. Special symbols include a purple octopus which can win you the Rapid Fire Jackpot, an oyster scatter and a gold-filled treasure chest wild. Landing three, four or five of the oyster scatter symbols anywhere on the reels will reward you with ten, twenty or thirty free spins along with the scatter prize. Thirty spins would be great but less is fine once you know that any wins you land here are tripled. There’s a nice little progressive jackpot available in Fishy Fortune and you will need to land five of the purple octopi on an active payline to grab it. Landing fewer of these creatures will not win any of the jackpot but will still be worth a combo win. The more paylines you play, the more chance you’ll have of cracking that progressive jackpot so if you can afford it, keep those paylines at maximum. Sometimes the simple slots are the best, especially if they look as good as Fishy Fortune; there’s no background music as such but there are some watery sound effects which add to the overall effects.